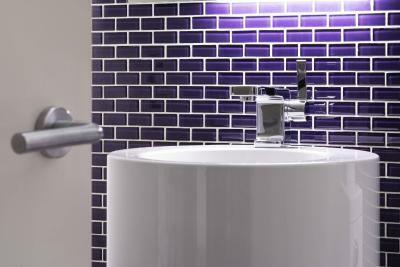 Lock in a great price for Le Meridien Chambers – rated 8.9 by recent guests! Staff was friendly. Location near the Orpheum theater was great. Beautiful, modern, clean and cozy. Love the art work and then comfortable bedding. Great location also! Everything was fantastic! Service was awesome!! Room was beautiful and spotless!! I would definitely stay there again!! The staff was so helpful and courteous above and beyond what we've seen at other properties. Room was comfortable, bathroom shower exceptional, overall would stay again and highly recommend. We loved the room, location, staff and the art. We will stay there next time we find ourselves in Minneapolis! The room was a corner suite and an amazing amount of space and a super comfortable bed. The staff was accommodating. We received a glass of wine upon checking in. Room was great, bed awesome, coffee and free water. Would stay again and highly recommend. I liked the overall style of the hotel. The room was a good size and very comfortable. Great location to all that I wanted to do on my stay. 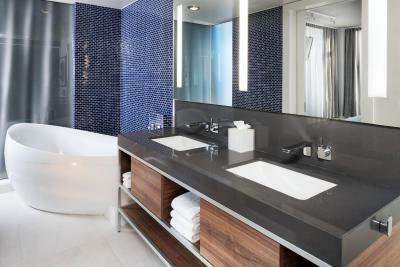 The bathrooms are unreal! 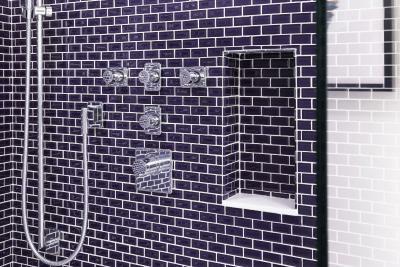 I could have slept in the shower! bathroom was very unique and modern! bed was very comfortable. Room was very clean! Le Meridien Chambers This rating is a reflection of how the property compares to the industry standard when it comes to price, facilities and services available. It's based on a self-evaluation by the property. Use this rating to help choose your stay! 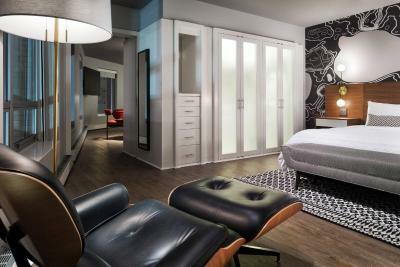 Le Meridien Chambers has spacious rooms equipped with bathrobes, slippers and a minibar. 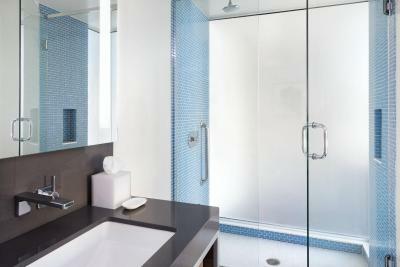 Bathrooms feature a walk-in rain shower. Room service is available 24 hours. Chambers Cafe at the Chambers Le Meridien serves steak, seafood, and various Italian options for breakfast, lunch and dinner. Guests can also enjoy a meal or cocktail at the contemporary outdoor Chambers Courtyard. 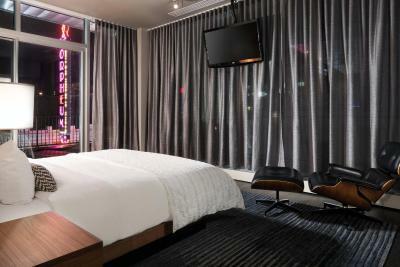 The State Theatre and Pantages Theatre are within 2 blocks of Le Meridien in Minneapolis. 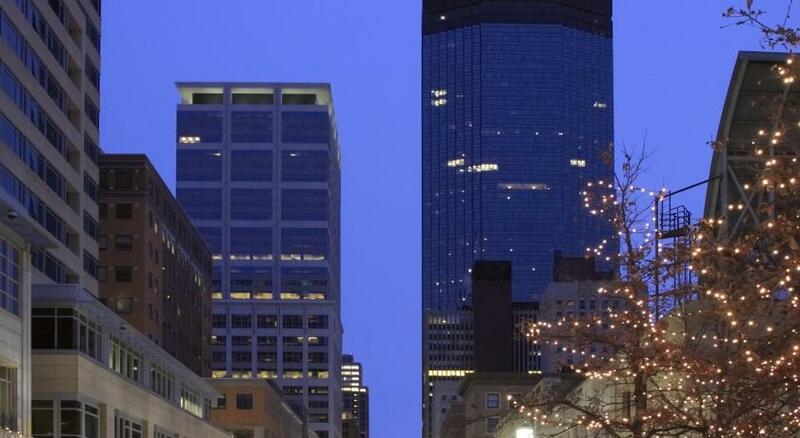 The Target Center, home of the Minnesota Timberwolves basketball team, is 3 blocks away. 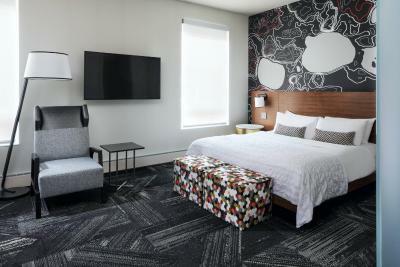 Le Meridien features 300 pieces of original artwork and the on-site Burnet Art Gallery offers 6 shows featuring local artists throughout the year. When would you like to stay at Le Meridien Chambers? Private parking is available on site (reservation is needed) and costs USD 46 per day. This double room has a bathrobe, fireplace and mini-bar. 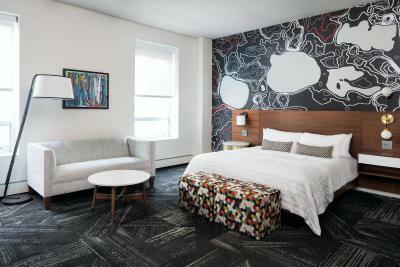 Le Méridien Chambers Minneapolis is an exclusive art hotel, offering 60 guest rooms in two landmark revival buildings in one of Minneapolis' most alluring neighborhoods. 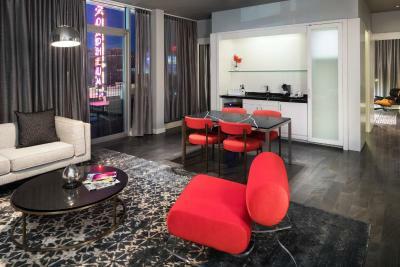 Le Méridien is designed for those individuals who are inspired by contemporary art and cuisine combined with great service. 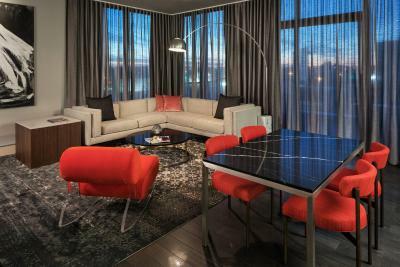 The lobby and guestrooms feature over 200 pieces of original contemporary art work. Discover MARIN Restaurant & Bar, a casual contemporary restaurant featuring a delicious array of specialty dishes, small plates, seasonal fare, and 24-hour in-room dining. 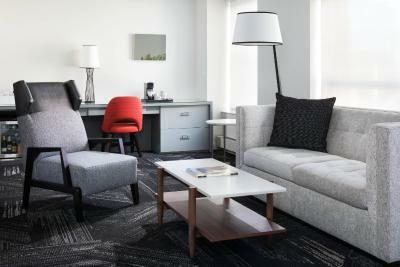 Explore all of the upscale hotel features of Le Méridien Chambers Minneapolis. 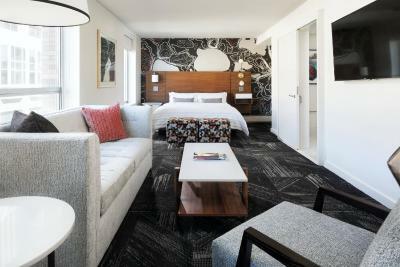 Located in the heart of downtown's historic theatre district in two landmark revival buildings renovated and designed by David Rockwell, our hotel is Minneapolis' first hotel to offer a true art, design and boutique experience. House Rules Le Meridien Chambers takes special requests – add in the next step! Le Meridien Chambers accepts these cards and reserves the right to temporarily hold an amount prior to arrival. A valet service is available and costs $34 per day. Smoke alarm hanging from ceiling. Red wine stains on bathroom floor. Toilet flush button really hard to use. Did not figure out how to navigate the TV other than channel by channel which seemed slow response and I found that frustrating. The espresso machine in the room wasn’t super easy to use but it wasn’t a big deal at all. I needed to reschedule my stay and booking.com was absolutely no help. I put in two requests to reschedule and got no reply. Also called the hotel and didn’t even get so much as a call back. I will NEVER books with either again!!!! Lobby very small with no really comfortable seating.Lobby lighting and entry very " flat" and artificial.Hallways and walkways stiff . NOTHING restful, warm and hospitable....even gas fireplace was cold. Needs makeover. PAYING FOR WIFI IS OUT OF DATE ! Staff both in lobby and restaurant were excellent. Restaurant seating not cosy lighting and color palate dreary not charming or even dim.. Menu strong on seafood, weak on housemade seasonal desserts...ex. no apples or cranberries.. (sherbets.ices ). Or maple or berries or pies. 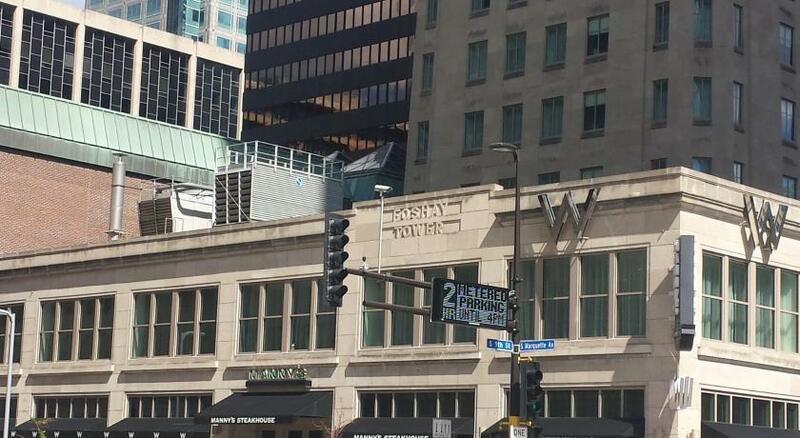 Lots of windows on busy Hennepin Ave but hotel architecture ignores location. Restaurant windows without covering offer no privacy for guests from street crowds. We were very disappointed. We stayed there once before and loved it! We assumed the room this trip would be similar. Instead - we got one of the “cheap seats” rooms. The room was tiny - room only for a bed and one chair. It opened to the courtyard where there was a wedding - which looked fun but was super loud with music. That didn’t end until midnight. The room it is stylish but extremely user unfriendly. The TV is a pain - no guide and it pauses for along time between stations so I just gave up. The WiFi is an extra $15. There are no ice machines. There is 1 hook in the bathroom - which makes it almost impossible to reuse towels. The sink is really hard to wash in without getting water everywhere. The hot water ran out during a very short shower. Parking is also super expensive. Most disappointing, however, was the management’s complete disregard of our displeasure with the room. He told me they were very busy and only had other rooms at a higher cost. When I asked if we could get out of our 2nd night so we could go elsewhere he refused. We had, however, booked through a 3rd party - maybe hotels.com - so that may have been beyond his control. It was more that he could not have cared less if we were happy with the room. Just so you know - I have travelled a lot and have never written a review before. 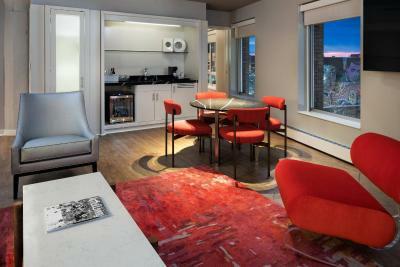 Comfortable pillows, good exercise room, great in room espresso, free bikes are great, heated bathroom floor. A larger sign where Valet location is. Very busy traffic location and no one was outside. We had to circle the block a couple times to find it. No internet included in price...had to pay extra.